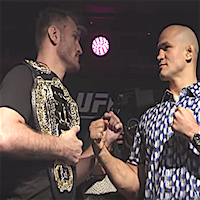 The stars of UFC 211 gathered in Dallas on Wednesday for media day obligations that included each of the competitors coming face-to-face for staredown photo ops. Heavyweight champ Stipe Miocic and former champ Junior dos Santos will clash in a rematch in the main event, while women’s strawweight champ Joanna Jędrzejczyk defends her belt against Brazilian powerhouse Jessica Andrade in the co-main event. Also, top welterweights Demian Maia and Jorge Masvidal, featherweight contenders Frankie Edgar and Yair Rodriguez, top flyweights Sergio Pettis and Henry Cejudo, and lightweight contenders Eddie Alvarez and Dustin Poirier, also faced-off.